I feel really glad when I see homely flavours in a five star hotel. I know most of the people go to the star hotels to have lavish meals served with pomp, something that can’t be created in home kitchens and no doubt that even I love to explore all the rich cuisines and cooking techniques both for the flavours as well as for the academic interest. But the most comforting meals are always the ones that revive homely comfort for me. Imagine my pleasure when I find a well made muli besan, a thick kadhi with pieces of radish in it, one of my favourite foods that I cook at home regularly. This is what happened when we decided to go to The Great Kabab Factory at Radisson Blu Plaza (Mahipalpur) this Sunday. They have a festival going on, showcasing some of the lost recipes introduced into their regular menu, Chef Vakil Ahmad has brought some intriguing recipes to the table this time. Although the new dishes being showcased are not lost from the cuisines, the dishes were definitely something people have started forgetting slowly. Apart from the muli besan I mentioned, the keema stuffed karela, the kheibari murgh ke parchey and murgh kabab gorkhar made us bow to the skill and hard work of Chef Vakil’s team. The menu was impressive with numerous starters, the signature galouti kabab, pathiya sekiya kukkad (chicken grilled over cow dung cakes, a Patiala specialty, recreated in tandoor), silbatte ke kabab (kababs made of stone ground meat), mahi kasoondi tikka (fish tikka in mustard marinade), murgh kabab gorkhar (stuffed and roasted whole chicken), kheibari murgh ke parchey (schnitzel style chicken kabab) and some impressive vegetarian kababs like subz galouti kabab and taza phalon ki chaat. The main course had the signature dal panchmel and dal makhni, the delicious muli besan being the new entrant. The sakora gosht (meat curry slow cooked in earthenware) and Kallu miyan ki raan from Lucknow were done to perfection, the biryani made of seviyan was one of the attraction as this type of biryani is made rarely now. 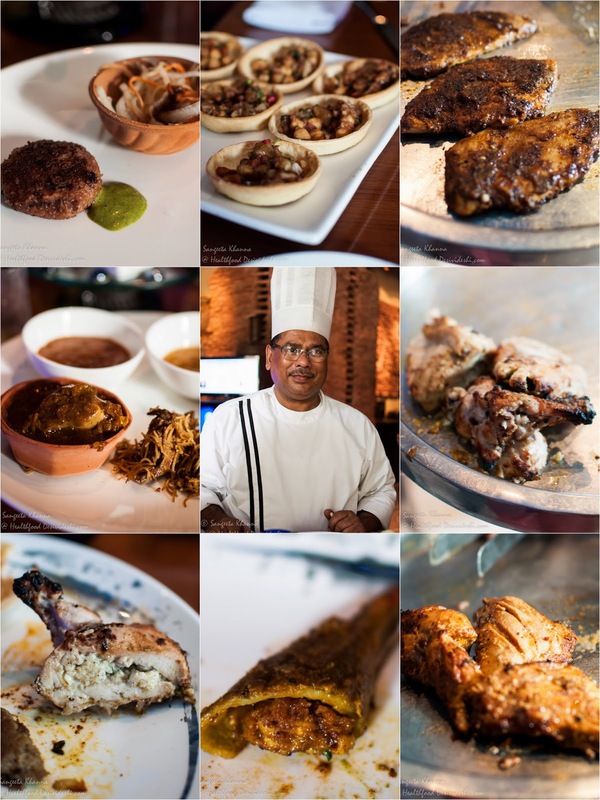 Seviyan biryani takes some skill and expertise to be done right and Chef Vakil’s team had done a wonderful job. The desserts included the dahi halwa from the kitchen of Sailana, gulab ki kheer and UP style malai chaap apart from TGKF signature kulfi and jalebi. My most favourite pick from this menu is the keema stuffed karela and besan muli as I mentioned above, the galaouti kabab has always been great at TGKF and the rotis have always made us feel indulgent. In the menu you would get the exotic foods as well as the homely comforting foods, the best of both worlds. TGKF is a place where we take our guests who want to eat good kababs and biryani in one place, served in traditional Indian style, where the menu is fixed and the wait staff bring everything to the table insisting you to take more servings, just like it was done in wedding parties few decades ago. The Great Kabab Factory gives a glimpse of the traditional Indian hospitality in this aspect.